Construction Equipment Market Size was valued at around USD 130 billion in 2017 and will grow at a CAGR of over 4% from 2018 to 2024. Lucrative employment opportunities coupled with industrialization in large cities across the globe are supporting the population shift from rural to urban areas. Rapid urbanization has led to a rise in the number of construction activities globally, thereby supporting the construction equipment market growth over the forecast timeline. The rising disposable income of individuals in the emerging economies has led to the demand for sophisticated infrastructures thereby compelling government organizations to refurbish the existing structures and undertake new construction activities. Speedy growth in the number of residential projects to provide housing solutions to the increasing urban population will favor the construction equipment market. Several government organizations are investing heavily in the infrastructure sector, which will contribute to the construction equipment market growth. Smart city projects in countries including India and Singapore will encourage the demand for high-quality construction machinery. Furthermore, the government of UK is also focusing on making heavy investments in the infrastructure industry for the overall economic development of the country. The government has announced The Construction Sector Deal that focuses on bringing together the manufacturing, construction, digital, and energy sectors to provide innovative approaches that help in improving the productivity. 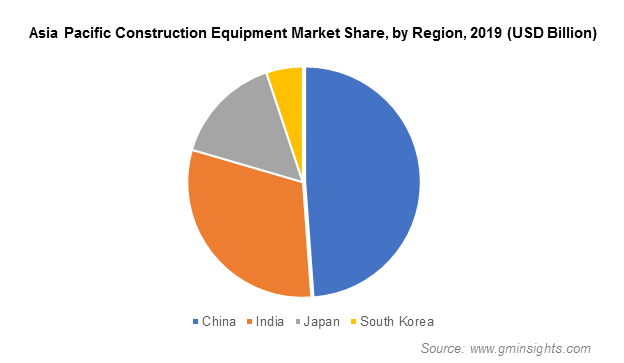 The high cost of the machinery is expected to hamper the construction equipment market growth. Organizations undertaking small projects still prefer traditional human techniques over modern machinery owing to budgetary constraints. The high operating and maintenance cost of this equipment is discouraging small-scale project owners to adopt technologically advanced equipment. In addition, the fluctuating fuel costs lead to uncertainties in estimating the overall operating expenditure and further limit the adoption of such machinery. The earthmoving and road-building equipment dominated the construction equipment market with over 50% of the revenue share owing to a rapid growth in the infrastructure development projects for enhanced road transport facilities and improved accessibility to remote areas. The large-scale expansion of road networks spurred the demand for fine-quality equipment thereby boosting the industry growth. The modernization of roadways & railways in countries including Russia and India will support the earthmoving and road-building equipment demand. Increasing mechanization in infrastructure activities is expected to further drive the construction equipment market growth. Booming industrialization favoring large-scale construction activities will further boost the demand for concrete equipment and expected to grow at a CAGR of over 5% from 2018 to 2024. High-strength concrete requirements coupled with tight project completion schedules will contribute to the construction equipment market growth. There is a rapid growth in the skyscraper and high-rise building constructions, thereby stressing the significance of high-quality concrete equipment. The escalating infrastructure development projects in countries such as India will favor the construction equipment market growth. The growing infrastructure activities in India have led to several equipment manufacturers expanding their market presence in the country to increase their global footprint. The rise in the number of players operating in the market in countries including China and India followed by the increased commercial and residential construction activities in China is supporting the industry growth. Furthermore, the increasing focus of the government of South Korea on developing the transport infrastructure of the country is anticipated to provide significant growth opportunities to the construction equipment market. European construction equipment market size is expected to grow at a CAGR of around 4% with several countries including Italy and Spain gaining stability after the economic crisis. The strong manufacturing sector in Germany will further favor the manufacturing of technologically-advanced machinery. German companies are looking to expand their industrial presence globally thereby providing a boost to the industry growth. In addition, the French government has embarked on a Big Investment Plan worth USD 66 billion to support structural reforms, which will further support the industry demand. 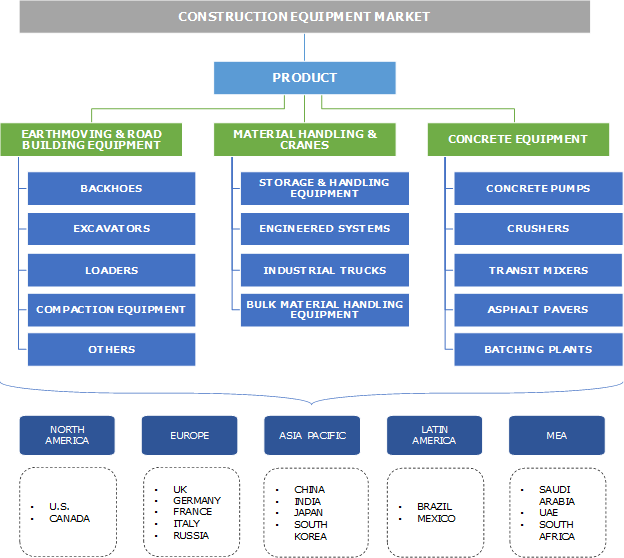 Key players operating in the construction equipment market include Komatsu Ltd., Caterpillar, Inc., XCMG Group, Volvo Construction Equipment, Hitachi Construction Machinery Co., Ltd., Zoomlion, CNH Industrial, Terex Corporation, Kobelco Construction Machinery Co., Ltd., Sany Group, and Liebherr. Companies are trying to strengthen their market presence by manufacturing equipment incorporated with the latest advanced technologies such as GPS tracking and remote monitoring to enhance the functionality of these machines. The construction equipment market will witness a growth with key players expanding their global footprint in untapped regions. Key players are concentrating on integrating state-of-the-art technologies such as telematics that enable the companies to be agiler and earn profits from a high ROI. The market players are emphasizing on providing online certifications and training courses for operators to ensure worker safety while operating the potentially dangerous equipment. The escalating construction sector coupled with rapid industrialization will support the construction equipment market growth. The growing infrastructure refurbishment activities across the globe for the overall economic growth will spur the demand for advanced machinery. Increasing demand from the rental sector with the rising focus on operator safety is expected to compel manufacturers to produce high-quality equipment, thereby propelling the industry demand. The supporting technological advancements are gaining popularity in the construction machinery sector and they enable the complete mechanization of the equipment. Rising labor costs in countries including China coupled with the increasing number of accidents have led to the demand for high-performance machinery. Stringent regulations are passed by authorities such as OSHA and ANSI that stress on worker safety. They also state regulations pertaining to the safety of operators that handle construction equipment. This has led manufacturers to produce high-quality construction machines to combat the labor shortage while ensuring the safety of the operator. Time constraints pertaining to the completion of large-scale government projects are further emphasizing the need to use automated machinery and replace traditional human activities. The demand for bulk-handling equipment that ensures fast completion of projects will favor the industry growth. The industry is slightly fragmented with a few players dominating the industry accounting for a major share of the revenue. Companies operating in the construction equipment market are increasingly focusing on complying with stringent regulations pertaining to emissions from the machinery.